Sterling food is located in Mangalore, Karnataka state, (west cost) south India. "Sterling" adj 1. Genuine. 2.Reliable. That's the meaning of our company (according to Webster's dictionary) and that is our mission - be Genuine and Reliable. We began operations in 1970, and have stood committed to Quality, Quantity & Reliability. We export shrimp, squid, ribbonfish, reef cod, Indian mackerel, cuttlefish etc in different forms to the quality-conscious markets of Japan, USA, Malaysia, Thailand, china, South Africa and Europe. 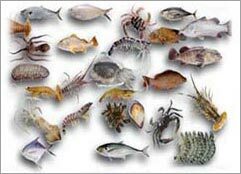 In addition, we supply value-added shrimp, squid, and cuttlefish in different forms to many of our customers. Our reputation for quality and reliability is best demonstrated by the long-term relationship with all our clients' abroad.